I’ve used this Universal Breastfeeding Symbol before. But I didn’t even realize I was a “lactivist” until I started getting frustrated about the breastfeeding in public issue. Who knew that an infant eating the food that was made for it could be an issue?! Hey you! With the breasts and starving child! You. Must. Go. Here. That is, until a righteous blogger brought up a Mothering Magazine online photo spread of the use of the symbol. Here’s the thing about breastfeeding in public. There is not a woman I know who does it to be an exhibitionist. Ever. At all. (Don’t argue with me here, folks.) We do it to…ummm…feed our children? So the use of the symbol: What is the proper way to use this welcoming sign? We have a lovely space for you to breastfeed your little one while your older child plays nearby safely. But you are more than welcome to feed that hungry, mewing baby wherever is best for you. We don’t want “special” rights as breastfeeders. We don’t even necessarily need a room! That is, unless there is nowhere to sit at said establishment and we’d like to do this more comfortably. We’ll do it discretely, yes, but we’ve got to get it done! The hungry child agrees. Nice offer and all, but I think I’ll sit elsewhere. The hungry child agrees. Interesting. You know I’ve never been anything but supportive of the symbol, but I think I agree now that you’ve put it this way. It’s almost sending a message to first time mom’s you must breastfeed here. As a 5 year veteran I just like the sign and nurse anywhere. You’re right. I don’t think that’s the symbol’s purpose. But many women don’t live in communities where BFing in public is supported or accepted. And while some of them may find privacy a blessing, I simply don’t want to be “sent” somewhere. I don’t have a problem BFing wherever, whenever, though my youngest is now 14 months and is just fine with waiting (and in public, he’s often much too distracted to remember the breasts!). A private, comfortable room is a luxury. But I don’t want women to feel that they *must* bow out of a much-needed social gathering (i.e. at a restaurant with family or friends) to tuck themselves away for other people’s social comfort. We don’t need to be put on a pedestal as BFers, but it should be culturally acceptable and encouraged, no matter where baby needs it. I do not feel the international breastfeeding symbol is by any means meant to be used as a tool to segregate women who nurse. 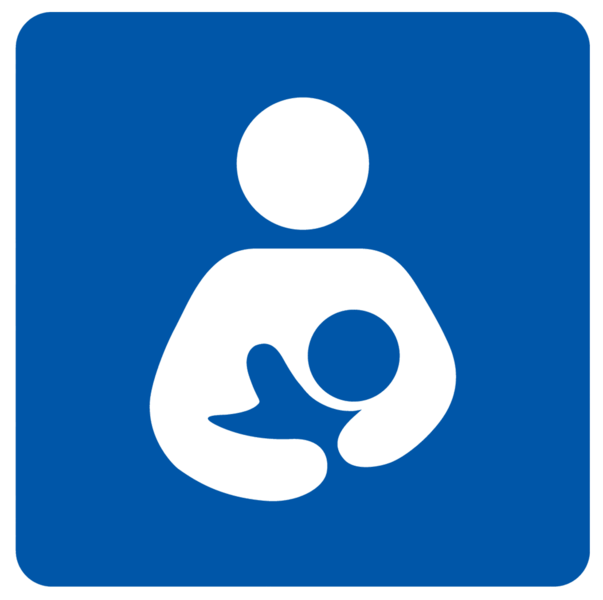 I do believe, however, that this symbol and its use in public establishments is a sign that there is a growing supportive community for women who DO choose to breastfeed their babes. Let’s face it, not all women who nurse are particularly excited about lifting up their shirts in public to nurse their young! I don’t believe the issue is the criticism they may receive but for the simple reasons of personal discretion. Some women may WELCOME the “family room” so they may have a little quiet and privacy to nurse. I certainly have no problems with nursing in public and will gladly sit in a restaurant, a dance recital, a bench in the park or where ever my little ones fancy to eat. However, if I do happen to cross paths with an establishment where the international breastfeeding symbol is proudly displayed, I consider it a luxury and will slip away into that private room to nurse my girls there. That symbol is supposed to represent the words “Breastfeeding Friendly.” That door didn’t look breastfeeding friendly to me. I’m not sure what I think, really. My gut reaction is that it does run the risk of being the place where women are ‘sent’ to nurse and that we shouldn’t need rooms like this, but I also understand that many women just aren’t comfortable nursing in public and if there are spaces set aside for them I’m all for it. I never thought I’d use one of those rooms but once I had my second child I changed my tune a little. My 3-year-old often would not stay with me while I was sitting down feeding my son and there has been more than one occasion where I had to chase after her with him still attached, or else abruptly detach him and frantically try to pull my shirt down while running after her. Not a fun scenario to be in. So I think nursing rooms do serve a purpose, for both moms who feel they need a bit more privacy and those who need the contained space for older children. Overall, I think the symbol is a good thing and that the more people who see it and, even on the smallest subconscious level, think of breastfeeding as normal and something that women are going to be doing in public, the better. I agree with Noble Savage. I’ll breastfeed wherever I choose to, sign or no sign… but I’ve known a few moms who are excruciatingly shy about breastfeeding, or whose babies won’t settle down to nurse well if there are too many distractions, who are happy with any reasonably quiet and private facility they can find. I think our society still needs some moms who refuse to be told go into a closet to nurse, but it’s important to recognize that it’s ok to be modest about breastfeeding too, and the sign is a friendly step in the right direction towards accommodating those shyer moms. Very interesting take on using the sign. As a veteran I also just choose to breastfeed wherever I choose. I also agree that the increased use of the sign shows more acceptance from the community for breastfeeding mothers. Also I’ve had a lot of women submit breastfeeding stories on breastfeeding in public. Some are quite serious while others are funny.